Pittsburgh Pirates starter Jameson Taillon is eager to heal the cut middle finger on his pitching hand, but there apparently is a line he won't cross. The 26-year-old right-hander has received plenty of advice on how to heal the laceration. Taillon lightheartedly told the Pittsburgh Tribune-Review he was willing to urinate on it to speed the healing process. "I said if it helps, I'll put a sign-up sheet and everyone can come and pee," he told the newspaper. "I don't care. I just want (the cut) to go away." However, he took to Twitter on Monday afternoon to write: "Gotta clarify this whole pee on hand thing. People offer up their remedy opinions.. I jokingly said if peeing on it gets me on the field where I belong, I'll put up a signup sheet. Not my thing, promise!" "But for real.. does it work? Asking for a friend." 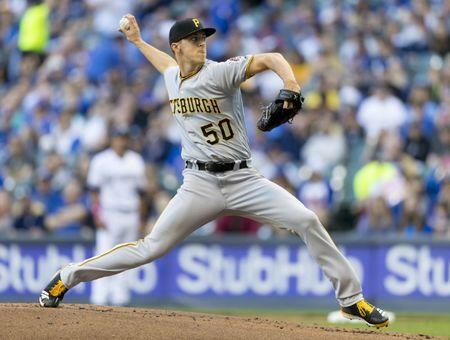 Taillon was pulled from his start Friday after three innings because of the injury. Baseball players have peed on their hands for years in the belief it toughens them, including pitchers to relieve or prevent blisters and batters who don't use gloves to prevent blisters as well. Moises Alou and Jorge Posada were among recent hitters to indulge in the practice, and pitcher Rich Hill admitted to it in 2016. However, it's still admittedly on the fringe. "If it helps, I would do it," Taillon told the paper. "I'm not scared, man. I just need to be out on the field." Taillon is 2-3 with a 4.08 ERA in eight starts this season. His next scheduled start is Wednesday against the visiting Chicago White Sox, but it is uncertain if he will be ready to pitch that day.